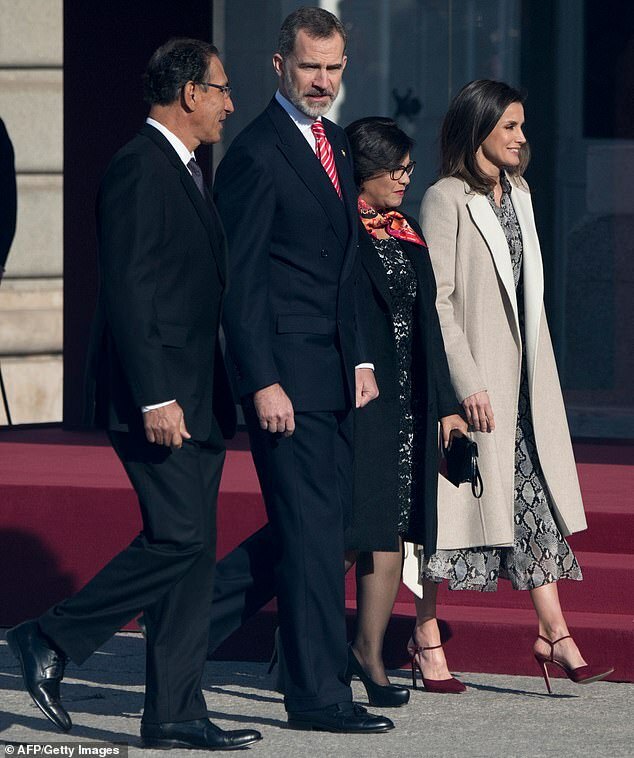 Queen Letizia of Spain stunned in a snakeskin print dress as she joined her husband King Felipe VI to welcome the president of Peru and his wife to Madrid today. The mother-of-two, 46, wore the below-the-knee number to greet Martín Vizcarra and his spouse Maribel Diaz at the royal palace in the Spanish capital. The ever-stylish Queen paired the black and grey garment with a cream waterfall coat and elegant red velvet stilettos. The President of Peru and his wife are on a three-day tour of the country, and are set to inaugurate the contemporary art fair ARCOmadrid tomorrow, of which Peru is a guest country. 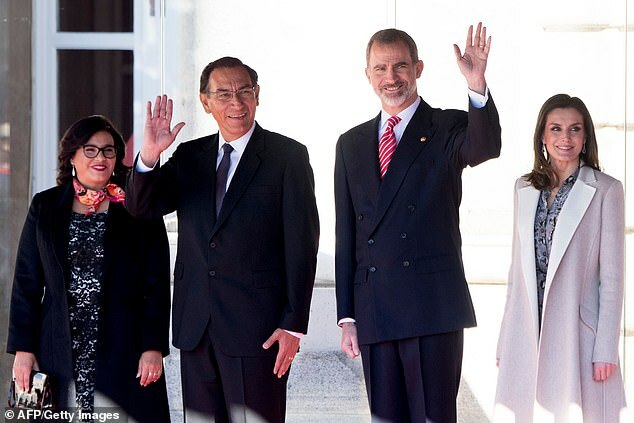 The Spanish royal and her husband, who married in 2004, were all smiles as they strolled along arm-in-arm ahead of the meeting. For the occasion Letizia showed off her glowing skin with a deep bronzer and tan eyeshadow alongside a neutral lip colour. 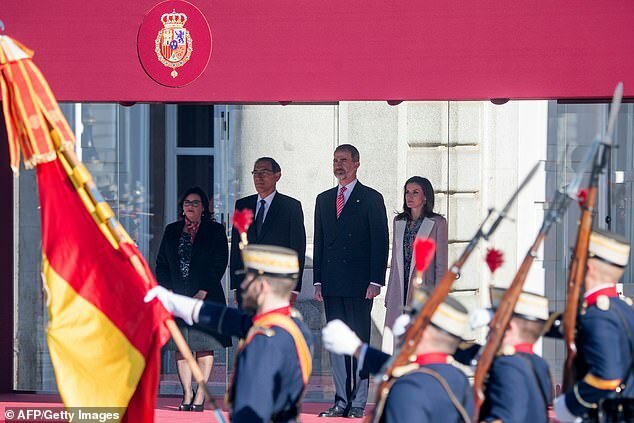 King Felipe wore a suave double-breasted suit paired with a red and white striped tie. As the special guests were welcomed for their three day visit the group also witnessed a parade by the royal guard, after which the President of Peru inspected the battalion. The royal couple will also host a reception at the royal palace in honour of their guests later on this evening. The visit comes after the British Ambassador to Morocco praised the Duchess of Sussex for avoiding the usual ‘pomp and pageantry’ of royal tours – days after Letizia and King Felipe visited the country. Diplomat Thomas Reilly told Harper’s Bazaar: ‘This was a very different kind of trip—personal, informal and away from the pomp and pageantry of traditional visits. While King Felipe and Queen Letizia met with schoolchildren during their visit like Harry and Meghan, there was not the same easy-going atmosphere captured on camera.